The pantropical genus Bauhinia, along with the northern temperate Cercis and several tropical genera, bear bilobate, bifoliolate, or sometimes unifoliolate leaves, which constitute the tribe Cercideae as sister to the rest of the family Leguminosae based on molecular phylogenetics. Hence, the fossil record of Cercideae is pivotal to understand the early evolution and biogeographic history of legumes. Three fossil species of Bauhinia were described from the Oligocene Ningming Formation of Guangxi, South China. Bauhinia ningmingensis sp. nov. is characterized by its bifoliolate, pulvinate leaves bearing basal acrodromous primary veins and brochidodromous secondary veins. B. cheniae sp. nov. bears moderately or deeply bilobate, pulvinate leaves, with basal actinodromous primary veins and eucamptodromous secondary veins. B. larsenii D.X. Zhang et Y.F. Chen emend. possesses shallowly or moderately bilobate, pulvinate leaves bearing basal actinodromous primary veins and brochidodromous secondary veins, as well as elliptic, stipitate, non-winged, and oligo-seeded fruits. Meanwhile, previously reported Bauhinia fossils were reviewed, and those pre-Oligocene foliage across the world are either questionable or have been rejected due to lacking of reliable evidence for their pulvini or/and basal actinodromous or acrodromous venations. Besides Oligocene leaves and fruits presented here, foliage and/or wood of Bauhinia have been documented from the Miocene–Pliocene of Thailand, India, Nepal, Uganda, and Ecuador. 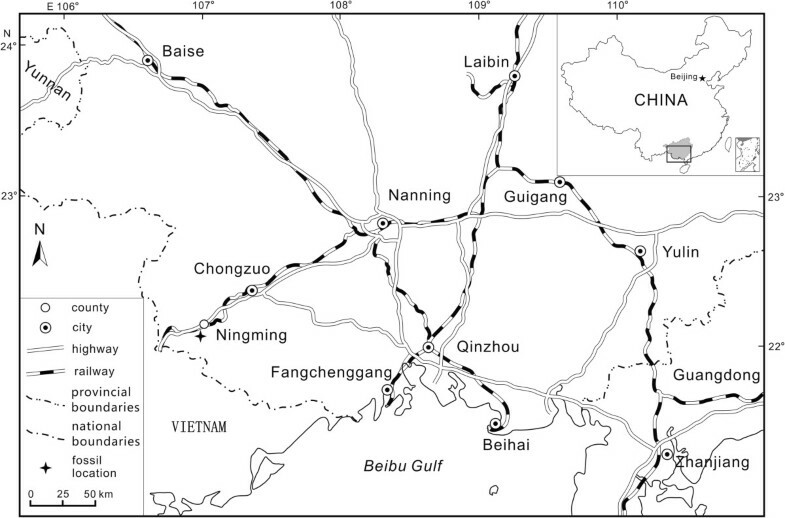 Bauhinia has exhibited a certain diversity with bifoliolate- and bilobate-leafed species in a low-latitude locality–Ningming since at least the Oligocene, implying that the tropical zone of South China may represent one of the centres for early diversification of the genus. The reliable macrofossils of Bauhinia and Cercis have made their debut in the Eocene–Oligocene floras from mid-low latitudes and appeared to lack in the coeval floras at high latitudes, implying a possible Tethys Seaway origin and spread of legumes. However, detailed scenarios for the historical biogeography of Bauhinia and its relatives still need more robust dataset from palaeobotany and molecular phylogeny in future research. Bauhinia L. (Leguminosae Juss., Caesalpinioideae DC.) is a pantropical legume genus with ca.150—300 species, the number of which depends on the demarcation of the genus [1–6] (see Additional file 1). The taxonomy of Bauhinia is especially complicated, and it has been recognized either as a large genus [1–3, 5, 7–9], or as 8-9 distinct genera [4, 6, 10] (Figure 1). Although a taxonomical consensus has not been achieved, recent studies on pollen morphology and molecular systematics of Bauhinia have suggested that Bauhinia sensu lato is not monophyletic and should be subdivided into Bauhinia sensu stricto and other independent genera [6, 10–13] (Figure 1). Bauhinia is well known for its ornamental shrubs and trees, such as B. blakeana Dunn being first chosen as the city flower of Hong Kong, China in 1965. In addition, seeds of B. petersiana Bolle are used as a coffee substitute ; some species, e.g., B. championii (Benth.) Benth., B. purpurea L., B. tomentosa L., have local pharmacological uses [14–16]. 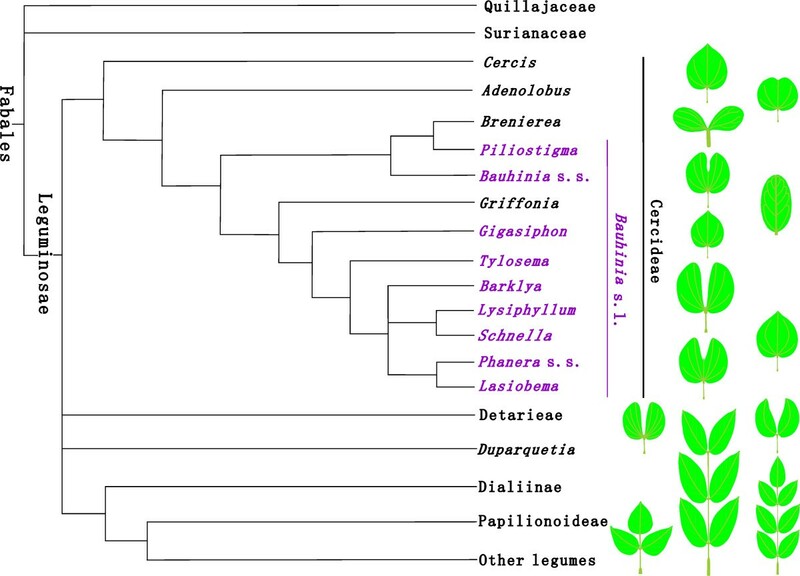 A simplified phylogenetic tree of the Leguminosae, with special reference to the phylogeny of the tribe Cercideae (after ,) and iconic leaf forms enhanced. The purple taxa belong to Bauhinia sensu lato. Bauhinia was named after two Swiss botanists, the brothers Jean Bauhin (1541–1613) and Gaspard Bauhin (1560–1624), suggesting a brotherly relationship in its commonly bilobate leaves . Bauhinia, along with a northern temperate genus Cercis L. and several tropical genera, bear bilobate, bifoliolate, or sometimes unifoliolate leaves, which constitute the tribe Cercideae Bronn as sister to the remaining legumes in the molecular phylogenetic trees [17–24]. Bilobate, bifoliolate, or unifoliolate pulvinate leaves with basal actinodromous or acrodromous venations are characteristic for Cercideae [25–27], whereas leaves of other legumes are usually pinnately compound, occasionally trifoliolate or palmate (Figure 1). Hence, well-preserved bilobate, bifoliolate, or unifoliolate pulvinate leaves are easily recognizable in the fossil record and can provide an instrumental evidence for understanding the early evolution and biogeographic history of the Cercideae and the Leguminosae. 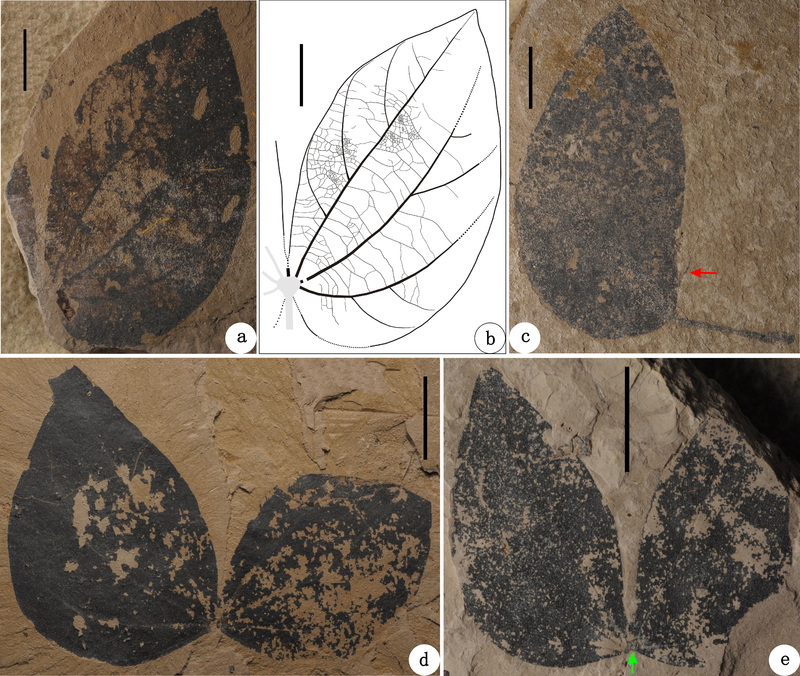 The goals of this paper are to (1) investigate and evaluate the fossil record of Bauhinia, with special reference to that of Cercis, by comparing both extinct and extant angiosperms with the similar lobed leaf forms, (2) describe the foliage and fruit fossils from the Oligocene Ningming Formation of Guangxi, South China, and discuss their biogeographic implications. The fossil foliage and fruits studied in this paper were collected from the Ningming Formation at 22°07.690’N, 107°02.434’E in the western region of Ningming County, Guangxi Zhuang Autonomous Region, South China (Figure 2). The Ningming Formation is primarily shallow lacustrine deposits consisting of gray to dark gray mudstone, light yellow shaly siltstone, and finely grained sandstone. No volcanic rocks and mammals are hitherto found in the Ningming Formation , and an absolute age for this formation is therefore unavailable. The Ningming Basin is among the late Palaeogene basins (e.g., mammal-bearing Na Duong and Bose basins) [29, 30] in southern Guangxi and northern Vietnam that experienced a generally similar geological history, so it is inferred that the Ningming Formation is likely to be late Eocene—Oligocene in age. The previous studies on plant macrofossils (e.g., Palaeocarya ningmingensis H.M. Li et Y.F. Chen, P. guangxiensis H.M. Li et Y.F. Chen, Bauhinia larsenii D.X. Zhang et Y.F. Chen, Cephalotaxus ningmingensis G.L. Shi et al., Cupressus guangxiensis G.L. Shi et al., and Calocedrus huashanensis G.L. Shi et al. ), sporo-pollen assemblages (e.g., Quercoidites microhenrici (Potonié) Potonié), and fishes (e.g., Ecocarpia ningmingensis G.J. Chen et al., Huashancyprinus robustispinus G.J. Chen et M.M. Chang) from the same locality indicate the Ningming Formation most possibly an Oligocene age [31–39], which is adopted in this paper. 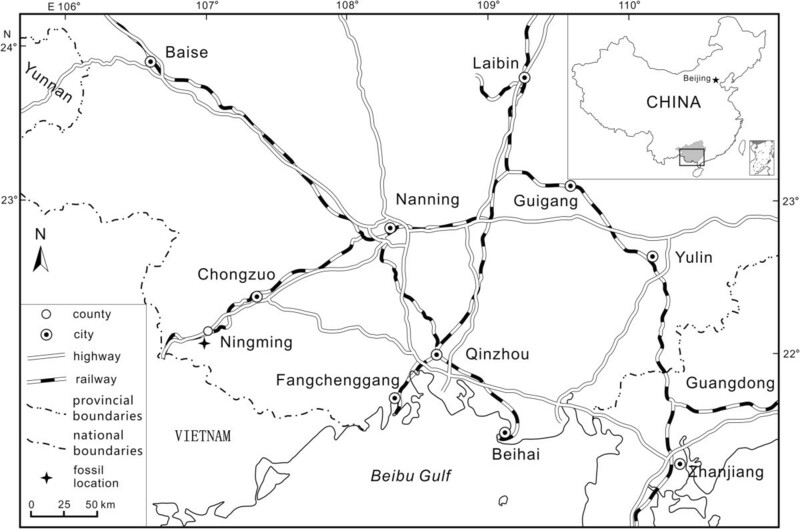 Fossil locality showing Ningming of Guangxi, South China (after ). In China, all the land belongs to our country. Our fossil-collecting fieldwork was done in non-National Nature Reserves (NNR) and non-private areas and has been allowed by the local government. We did not violate the Chinese fossil collection and mining laws and management regulations. The macrofossils are preserved as compressions/impressions only with a little organic material remaining in mudstone. Cuticle preparations were unsuccessful because organic material has been greatly weathered. All the marcofossil specimens used herein are deposited at Natural History Museum of Guangxi (NHMG), Nanning, P.R. China (see Additional file 2). The exsiccatae examined in this study are kept at the following herbaria: Chengdu Institute of Biology, Chinese Academy of Sciences, Chengdu (CDBI), Guangxi Institute of Botany, Chinese Academy of Sciences, Guilin (IBK), South China Botanical Garden, Chinese Academy of Sciences, Guangzhou (IBSC), the Herbarium of Northeast China, Shenyang (IFP), Kunming Institute of Botany, Chinese Academy of Sciences, Kunming (KUN), and the Chinese National Herbarium, Beijing (PE) (see Additional file 2). eFloras.org . Bauhinia and other living taxa concerned here were consulted (Figure 3; see Additional file 3). (2) Chinese Virtual Herbarium (CVH) . The images of herbarium specimens were browsed. (3) ILDIS (International Legume Database & Information Service) . 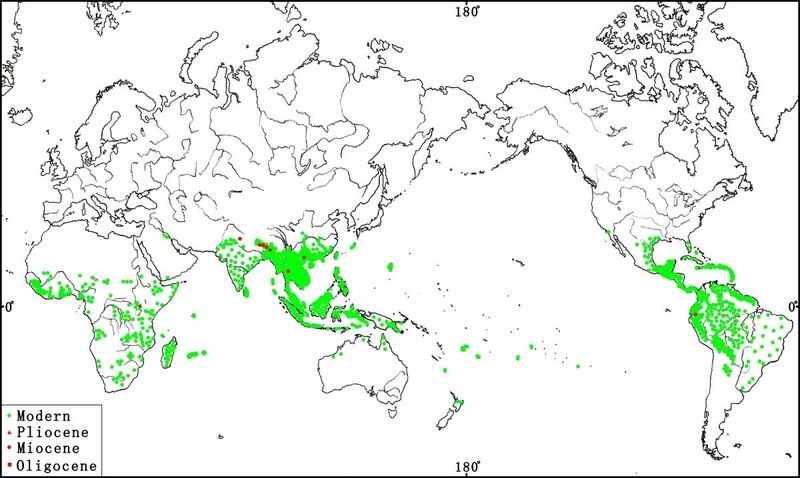 The geographic distribution of living species in Bauhinia is compiled by ILDIS, with a few newly published records (Figure 4; see Additional file 1). (4) Hunt Institute for Botanical Documentation . Standardized abbreviations of plant-family names and periodical titles in this paper were consulted and applied (see References; Additional file 3). 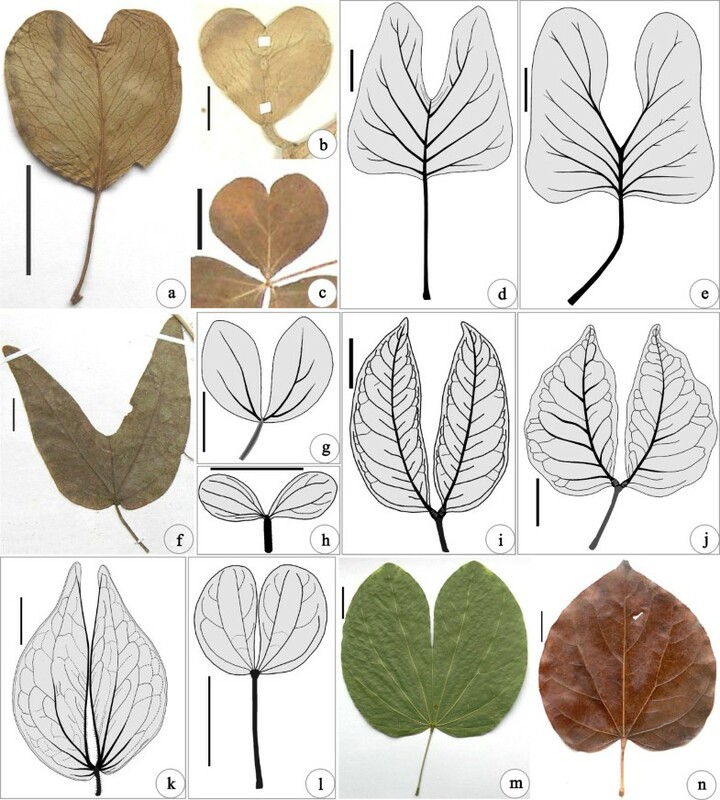 Similar leaf forms in Bauhinia and other angiospermous taxa. (a) Ipomoea pes-caprae (L.) R. Br. Specimen: PE12054. (b) Hoya kerrii Craib. Specimen: IBSC199290. (c) Oxalis corymbosa DC. Specimen: PE1688774. (d) Liriodendrites bradacii K.R. Johnson . (e) Liriophyllum kansense Dilcher et P.R. Crane . (f) Passiflora cupiformis Masters. Specimen: KUN0368045. (g) Zygophyllum fabago L. . (h) Brenierea insignis Humbert . (i) Hymenaea courbaril L. . (j) Guibourtia coleosperma (Benth.) J. Léonard . (k) Aphanocalyx richardsiae (J. Léonard) Wieringa [48, 49]. (l) Bauhinia didyma L. . (m) Bauhinia variegata L. Cultivated at NHMG, Nanning and photographed by Qi Wang on October 17th 2013, also see the Cover Image of this paper. (n) Cercis chinensis Bunge. Cultivated at the Institute of Botany, Beijing. Scale bars = 2 cm. Distributions of modern and fossil Bauhinia L. (The base map drawn by Mr. Sun Yingbao, Institute of Botany, CAS, Beijing). Green dots indicate modern distributions . Red symbols show fossils from the Oligocene–Miocene of China , this paper, Ecuador , India [51–54], Nepal , Thailand , and Uganda . Terms used in the specimen descriptions for leaves and fruits follow Ellis et al. . As for the foliage of the Cercideae, the lower pulvinus has been interpreted as a primary pulvinus at the base of the leaf while the upper pulvinus as a secondary pulvinus homologous with the pulvinus on the leaflet petiolule, consisting of an apical common joint with two distal laminar joints, one for each half of the lamina [25, 27, 59]. Anatomically, laminar joints are resulted from the tertiary pulvini at the base of each primary vein . Van der Pijl  classified the leaves of Bauhinia into three basic types: unifoliolate, bilobate, and bifoliolate. Cusset  subdivided the leaves of the tribe Bauhinieae Benth. into seven types, but unifoliolate, bilobate, and bifoliolate types epitomize in the foliage of living and fossil species of Bauhinia. Hence, unifoliolate, bilobate, and bifoliolate leaves are adopted herein for the description of Bauhinia foliage. Time calibrations refer to the latest Geologic Time Scale . The global palaeogeographic maps for the Late Cretaceous, Palaeocene, Eocene, and Oligocene were browsed . Both fossil and extant taxa bearing similar unifolioate, bilobate, and bifoliolate leaves in Leguminosae and other families (Figure 3; see Additional file 3) were compared to evaluate the fossil record and biogeographic history of Bauhinia. Based upon an extensive review on the literature and specimens of previously reported Bauhinia and other similar foliage from the Cretaceous and Cenozoic, we summarized the reliable fossil record of Bauhinia (see Additional file 4). Photographs of specimens were taken with digital cameras (Panasonic DMC-FZ30 and Nikon D90). A simplified phylogenetic tree (Figure 1) of the Cercideae within Leguminosae was partially adapted from the literature [10, 17], with the iconic leaf forms enhanced. A map for the fossil locality (Figure 2) was partially adapted from the literature . Line drawings of leaf specimens for fossil and living taxa as well as of distributional map of Bauhinia were drawn (Figures 3,4,5,6,7 and 8) and arranged using CorelDRAW 10.0 (Corel, Ottawa, Ontario, Canada) and Adobe Photoshop 6.0 (San Jose, California, USA) programmes. Bauhinia ningmingensis sp. nov. from the Oligocene of Ningming, Guangxi, South China. (a) NHMG 011655. The foliage apex is not preserved. (b- c) Holotype: NHMG 011654, and its line-drawing, showing the leaf architectural detail. (d) The apex of holotype, showing the higher-order veins. (e) The base of holotype, showing the pulvinate tissue. Scale bars = 1 cm. Bauhinia cheniae sp. nov. from the Oligocene of Ningming, Guangxi, South China. (a- b) Holotype: NHMG 011656a, b. Red arrow indicates the position of the sinus. (c) Line-drawing of holotype, showing the leaf architectural detail. (d) NHMG 011657. Red arrow indicates the position of the sinus. Green arrow shows a folded leaf base. (e) Enlargement of the petiole in d, showing thickened upper and lower pulvini as well as dense, spreading hairs. (f) NHMG 011658. Red arrow indicates the position of the sinus. Green arrows indicate partially overlapped primary veins, implying this leaf is folded. (g) NHMG 011659, with the higher-order veins. Red arrow indicates a short spine in the sinus. Green arrow shows a semicircular laminar joint at the leaf base. Scale bars = 1 cm. Additional leaves of Bauhinia cheniae sp. nov. from Ningming. (a- b) NHMG 011670, and its line-drawing, showing the leaf architectural detail. (c) NHMG 011671. Red arrow indicates a long spine in the sinus of folded leaf. (d- e) NHMG 011672, 011673, showing two deeply bilobate leaves. Green arrow shows a semicircular laminar joint at the leaf base. Scale bars = 1 cm. Bauhinia larsenii D.X. Zhang et Y.F. Chen emend. from the Oligocene of Ningming, Guangxi, South China. (a- b) Holotype: NHMG 45003. (b) Partial enlargement of holotype. White arrows show an organic connection of the leafy shoot and fruit. (c- d) NHMG 45004 and its line-drawing, showing the leaf architectural detail. (e) NHMG 45019, showing a detached fruit. Red arrow refers to a thin, long stipe. (f) NHMG 45012. Red arrow indicates a short spine in the sinus of folded leaf. (g) NHMG 011676. Yellow arrow refers to a thickened upper pulvinus. (h) NHMG 011678. Red arrow indicates the position of the sinus of folded leaf. (i) NHMG 011677. Green arrows indicate partially overlapped primary veins, implying this leaf is folded. Scale bars = 1 cm. A leaf lamina partially or fully divided into two lobes is not very common but remarkable among angiosperms. Such leaf forms can be traced back to the Late Cretaceous, for example extinct Liriodendron-like angiosperms Liriodendrites bradacii K.R. Johnson  and Liriophyllum kansense Dilcher et P.R. Crane  (Figure 3d,e), but some of them have been erroneously identified as Bauhinia fossils (see Additional file 4). Overall, both extinct and extant taxa bearing bilobate and bifoliolate foliage occur in Leguminosae, Apocynaceae Juss., Convolvulaceae Juss., Liriodendraceae sensu M.S. Romanov et Dilcher, Oxalidaceae Bercht. et J. Presl, Passifloraceae Juss. ex Roussel, Proteaceae Juss., and Zygophyllaceae R. Br.. 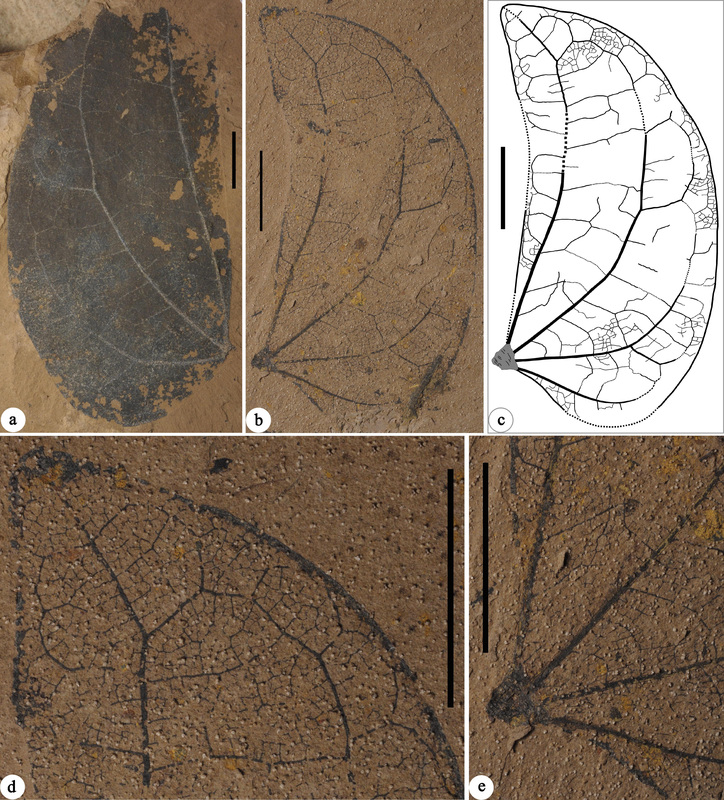 In order to determine the reliable fossils of Bauhinia, comparisons are made among both extinct and extant taxa with similar lobed leaf forms (Figure 3; see Additional file 3). The systematics of living Bauhinia L. is primarily based upon growth habit, inflorescence, flower, calyx, hypanthium, petal, fertile stamen number, stamen filament, gynophore, stigma, pollen, fruit, seed, and leaf morphology [1–8, 12, 13], as well as molecular data [9, 11]. Species of Bauhinia sensu stricto are usually trees or shrubs, rarely semi-scandent plants, whereas those of Lysiphyllum (Benth.) De Wit, Schnella Raddi, Tylosema (Schweinf.) Torre et Hillc., and Phanera Lour. (all belonging to Bauhinia sensu lato) are lianas, herbaceous vines or rarely shrubs. Different character combinations in reproductive and vegetative organs have been used to classify Bauhinia sensu lato into Bauhinia sensu stricto and other 7-8 genera, with reference to the molecular phylogenetics of Cercideae [4, 6, 10] (Figure 1). Bauhinia sensu stricto as one of the first branching lineages is the only pantropical genus in the subtribe Bauhiniinae (Benth.) Walp. of Cercideae, so it may boast an earlier origin and evolutionary history than other relatives within the Bauhiniinae. Morphological characters are the features that ultimately support the distinctiveness of real biological entities, so integral studies mutually illuminating between morphology and molecular systematics will be key in the discrimination of elusive relationships within Bauhinia sensu lato. However, considerable convergence, parallelism or evolutionary conservativeness in the organs (especially leaves) of Bauhinia sensu stricto and its relatives often place palaeobotanists in a predicament. Without reproductive organs (especially the calyces, fertile stamens, and petals), bilobate leaves of some species in Bauhinia sensu stricto, Phanera, and Schnella would not be distinguished from each other even by neobotanists. Hence, bilobate or bifoliolate leaf fossils in Cercideae were often assigned to Bauhinia sensu lato (see Additional file 4). Overall, Bauhinia bears mostly bilobate, bifoliolate, or sometimes unifoliolate leaves having characteristic upper and lower pulvini, basal actinodromous or acrodromous primary veins (3-13 in number per leaf), brochidodromous, eucamptodromous or craspedodromous secondary veins, and alternate or opposite percurrent tertiary veins, character combinations of which are noticeably different from the lobed foliage of genera in the tribe Detarieae sensu lato Polhill of Leguminosae, as well as in Apocynaceae, Convolvulaceae, Liriodendraceae, Oxalidaceae, Passifloraceae, Proteaceae Juss., and Zygophyllaceae (see Figure 3; Additional file 3). The simple, unlobed leaves of Bauhinia also differ from those of Cercis in the tribe Cercideae in the former usually bearing fewer and weaker secondary veins along the distal third of the midvein and a mucro or spine at the leaf tip . Based upon an extensive review on the previously reported Bauhinia and other similar foliage from the Cretaceous and Cenozoic, those pre-Oligocene reports regarding Bauhinia across the world are either questionable or have been rejected (see Additional file 4). Besides the reliable fossils from Ningming of China, foliage and/or wood of Bauhinia have been described from the Miocene-Pliocene of Thailand, India, Nepal, Uganda, and Ecuador. Lateral primary veins approach to the margin; secondary veins eucamptodromous----------------------------------------------------------------Bauhinia cheniae sp. nov.
Bilobate, bifid to ca. 1/2 to 3/5 of laminar length------------------------------------------------Bauhinia larsenii D.X. Zhang et Y.F. Chen emend. Bifoliolate, bifid to laminar base-------------------------------------Bauhinia ningmingensis sp. nov.
Three fossil species of Bauhinia are described as follows. All the voucher specimens were collected from the same locality and stratigraphy, and they are deposited at the same museum. Ningming County, Guangxi Zhuang Autonomous Region, South China (Figure 2). Natural History Museum of Guangxi (NHMG), Nanning, P.R. China. Bauhinia ningmingensis Qi Wang, Z. Q. Song, Y. F. Chen, S. Shen et Z. Y. Li, sp. nov. (Figure 5a-e). The specific epithet is derived from Ningming County, where the fossils were collected. NHMG 011654 (Figure 5b-e) (designated here). NHMG 011655 (Figure 5a) (designated here). Small, bifoliolate leaves. Leaflets pulvinate and laminae strongly asymmetrical, obliquely ovate or slightly falcate. Leaflet apexes obtuse. Bases wide cuneate or slightly concave. Margin entire. Primary veins basal acrodromous (3-4 in number) and curved on the exmedial side, not reaching the leaflet margin. Secondary veins brochidodromous. Tertiary veins percurrent or ramified, straight, convex or sinuous. Quaternary veins forming irregular polygons. Aerolation well developed. Freely ending veinlets mostly branching once. Marginal ultimate veins looped and fimbriate. Bifoliolate leaves inferred from the symmetry of individual leaflets. Leaflet laminae strongly asymmetrical, obliquely ovate or slightly falcate (Figure 5a-c), ca. 4.0-5.3 cm long and 2.0-2.6 cm wide, with partially preserved pulvinate tissue, ca. 2.5 mm long, showing some horizontal striations (Figure 5c,e). The petiole not preserved. Texture apparently membranous to chartaceous. Leaflet apexes obtuse (Figure 5b,d). Bases wide cuneate or slightly concave (Figure 5a-c,e). Margin entire. Primary veins basal acrodromous, 3-4 in number. Innermost primary veins straight or curved, extremely approaching to the leaflet margin at the base and reaching the leaflet apex. Primary veins on the exmedial side curved, connecting with secondary veins to form a series of arches and loops, not reaching the leaflet margin (Figure 5a-c). Outermost primary veins shorter and weaker. Secondary veins brochidodromous, diverging at ca. 60°-90° from the primary veins on the exmedial side. Tertiary veins alternate and opposite percurrent or ramified, straight, convex or sinuous (Figure 5a-c). Quaternary veins forming irregular polygons. Aerolation well developed. Freely ending veinlets mostly branching once. Marginal ultimate veins looped and fimbriate (Figure 5b-d). This fossil new species B. ningmingensis is very similar to living B. madagascariensis subsp. meridionalis Du Puy et R. Rabev. and B. didyma L. Chen [3, 5, 41] (Figure 3l; see Additional file 3), which are distributed in southeastern Madagascar and southern China, Myanmar, northern Thailand, respectively. However, it noticeably bears much larger leaflets (ca. 4.0-5.3×2.0-2.6 cm) than those of the two living species (ca. 0.7-3 × 04-1.7 cm and 1.2-2.4 × 0.9-1.6 cm). In addition, B. ningmingensis sp. nov. is different from the previously reported bifoliolate fossil species B. ecuadorensis E.W. Berry  and B. siwalika U. Lakh. et N. Awasthi  from the Miocene of India and Ecuador in the leaf architectural detail (see Additional files 3 and 4). Bauhinia cheniae Qi Wang, Z. Q. Song, Y. F. Chen, S. Shen et Z. Y. Li, sp. nov. (Figures 6a-g, 7a-e). The specific epithet is dedicated to Prof. Chen Dezhao (Chen Te-chao) (South China Botanical Garden, CAS) for her important contribution to the taxonomy of Cercideae. NHMG 011656a, b (Figure 6a-c) (designated here; part and counterpart specimens). NHMG 011657, 011658, 011659 (Figure 6d-g), 011670 (Figure 7a,b), 011671, 011672, 011673 (Figure 7c-e), 011674, 011675, 011660, 011661, 011662, 011663, 011664, 011665, 011666, 011667, 011668, and 011669 (designated here). Small, broadly ovate or suborbicular, moderately or deeply bilobate leaves. Petioles glabrescent or hairy, bearing thicken upper and lower pulvini. Lobe apexes slightly acuminate, obtuse or rounded. Laminar bases shallowly to deeply cordate. Margin entire. Primary veins basal actinodromous, 7-9 in number. The midvein terminated in a short or long spine within a narrow or flaring sinus. Lateral primary veins straight or curved, branched or unbranched, approaching to the margin. Secondary veins eucamptodromous. Intersecondary veins present. Tertiary veins percurrent or ramified, mostly convex, sinuous or rarely straight. Quaternary veins percurrent, forming irregular polygons. Aerolation well developed. Freely ending veinlets mostly unbranched. Marginal ultimate veins absent. Bilobate leaves, wide ovate or suborbicular, ca. 2.0-6.0 cm long and 2.2-6.5 cm wide, often folded along the midvein (Figures 6a-c, 7a-e). The petiole glabrescent or covered with dense, spreading hairs (Figure 6d,e).The petiole stout, ca. 1.6-2.0 cm long, bearing thickened, upper and lower pulvini (Figures 6d,e 7c). The upper pulvinus connecting the laminar base via a tiny, semicircular laminar joint. Bifid to ca. 2/3-4/5 of laminar length or almost to the laminar base, forming a narrow or flaring sinus. Two lobes symmetrical or slightly asymmetrical. Lobe apex slightly acuminate, obtuse or rounded (Figures 6a-d,f and 7a-e). Laminar base symmetrical, shallowly to deeply cordate (Figures 6a-d,f,g, 7a-e). Margin entire. Texture apparently chartaceous. Primary veins basal actinodromous, 7-9 in number, the outmost pair and midvein being weaker than the inner pairs. Midvein terminated in a short or long spine within the sinus (Figures 6g, 7c). Lateral primary veins straight or curved, branched or unbranched, and the innermost pair reaching the lobe apex and outer pairs approaching to the margin. Secondary veins eucamptodromous, diverging at ca. 30°-80° mainly from the innermost and outmost lateral primary veins and arching upward along the margin (Figures 6a-c,f,g, 7a,b). A pair of secondary veins usually emitting from the midvein near the sinus and approaching to the inner margin of lobes (Figure 6b-d, f). Intersecondary veins sometimes present, parallel to subjacent secondary veins. Tertiary veins alternate and opposite percurrent or ramified, mostly convex, sinuous or rarely straight. Quaternary veins alternate and opposite percurrent, forming irregular polygons (Figures 6b,c,g, 7a,b). Aerolation well developed. Freely ending veinlets mostly unbranched. Marginal ultimate veins absent. This fossil new species B. cheniae is very similar to living B. variegata L. (Figure 3m) and B. purpurea L. [3, 5, 41] in having deeply bilobate leaves and eucamptodromous secondary veins, but it differs from the extant species in having the fewer primary veins and a densely hairy petiole (see Additional file 3). In these respects, B. cheniae sp. nov. is also different from the previously reported, bilobate leafed fossil species B. larsenii D.X. Zhang et Y.F. Chen , B. krishnanunnii A.K. Mathur et al. , B. ramthiensis Antal et N. Awasthi , B. nepalensis N. Awasthi et N. Prasad , Bauhinia sp. 1 , Bauhinia sp. 2 , and B. waylandii R.W. Chaney  from the Miocene–Pliocene of India, Nepal, Thailand, and Uganda (see Additional files 3 and 4). Bauhinia larsenii D.X. Zhang et Y. F. Chen emend. Qi Wang, Z. Q. Song, Y. F. Chen, S. Shen et Z. Y. Li (Figure 8a-i). Bauhinia larsenii D.X. Zhang et Y. F. Chen, see Chen and Zhang in Bot. J. Linn. Soc. 147: 439, Figures 1, 2, 3, 5 and 6, 2005. NHMG 45003 (Figure 8a,b herein) (first designated and illustrated by Chen and Zhang : Figure 1]). NHMG 45004 (counterpart specimen of holotype; first figured herein, Figure 8c,d), 45012 and 45019 (first designated and illustrated by Chen and Zhang : Figures 2 and 6; Figure 8f,e herein). NHMG 011676, 011678, 011677 (Figure 8g-i), and 011679. Leaves suborbicular or slightly ovate to wide ovate, ca. 2.1-4.5 cm long and 1.8-4.8 cm wide, usually folded along the midvein (Figure 8a-d, f-i). Bifid to ca.1/2-3/5 of laminar length, forming a narrow sinus. Two lobes symmetrical or slightly asymmetrical. Lobe apex rounded to obtuse (Figure 8a,c,d,f). Laminar base symmetrical, rounded or shallowly cordate (Figure 8a,c,d,g). Margin entire. Texture apparently chartaceous to coriaceous. Primary veins basal actinodromous, 5-9 in number, the outmost pair being weaker than the midvein and inner pairs. Midvein terminated in a short spine within the sinus. Lateral primary veins branched or unbranched, and the innermost pair reaching the lobe apex. Major secondary veins brochidodromous, diverging at ca. 45°—60° from the lateral primary veins mainly on the exmedial side and sporadically on the admedial side (Figure 8d). A pair of minor secondary veins emitting from the midvein near the sinus and approaching to the inner margin of lobes (Figure 8d). Secondary veins fused with each other or the branches of primary veins to form loops near the leaf margin, or arcs between the primary veins. Tertiary veins alternate and opposite percurrent or ramified, convex or sinuous. Quaternary veins alternate percurrent. Marginal ultimate veins looped and fimbriate (Figure 8d). Other higher-order veins invisible. The petiole, ca. 1.0-2.2 cm long, with an upper pulvinus and a lower pulvinus (Figure 8a,c,d,f-i). The upper pulvinus thickened, connecting the laminar base via a tiny, semicircular laminar joint. The lower pulvinus slightly thickened, attached at a curved vegetative shoot at ca. 45°. Not far from the lower pulvinus, a fruit attached on the shoot (Figure 8a-c). The pedicel, ca. 0.2 cm long, with an inferior perianth scar and a fruit, indicating the flower of its parent plant hypogynous (Figure 8a). The fruit elliptic, ca. 2.8-3.5 cm long and 1.0-1.1 cm wide, with a slightly curved, acuminate base and an acute apex (Figure 8a-c,e). The fruit base bearing a thin stipe, ca. 0.4-0.8 cm long (Figure 8e). The suture slightly thickened and non-winged. Carbonaceous remnants with an oblique orientation on the valve surface (Figure 8e) implying the fruit unilocular, possibly coriaceous in texture, and tardily dehiscent. Seeds, about 2-4 in number in a fruit, grossly elliptic or oblong in contour (Figure 8a-c), ca. 0.3-0.6 cm long and 0.2-0.3 cm wide, oriented with their length perpendicular to the fruit length. This fossil species B. larsenii was first described by Chen and Zhang  on the basis of four specimens. Here, we emended this species, especially regarding the leaf architecture and fruit morphology, based upon the type specimens and newly collected materials. It is very similar to living B. viridescens Desv. and B. brachycarpa Wall. ex Benth. [3, 5, 41] in bearing shallowly or moderately bilobate leaves, brochidodromous secondary vein, and elliptic fruits (see Additional file 3). However, no adequate characters guarantee the fossils to belong to any living species. In addition, B. larsenii is different from B. cheniae sp. nov. and other fossil species [33, 50–57] in the leaf architectural detail (see Additional files 3 and 4). 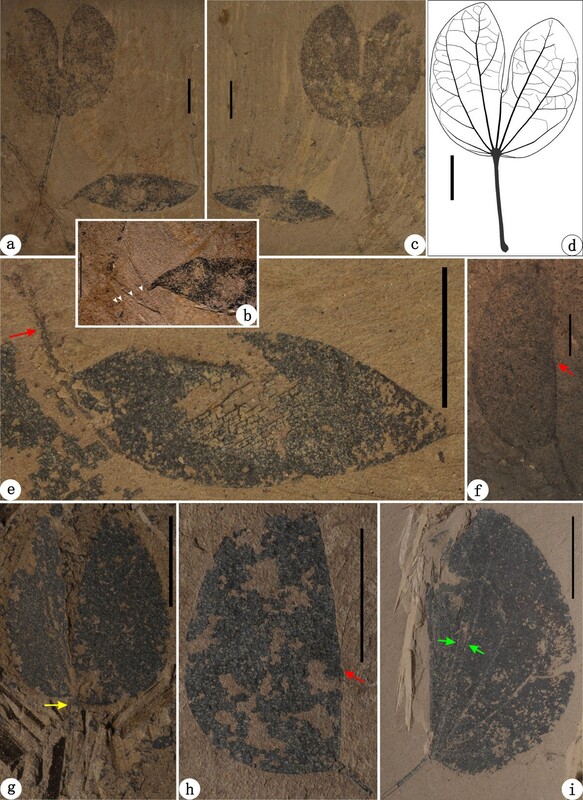 In particular, B. larsenii represents the first recognition of Bauhinia fruit and foliage organically connected in the fossil record. The Leguminosae is the third largest angiosperm family only after Orchidaceae Juss. and Asteraceae Bercht. et J. Presl, varying in habit from herbs to shrubs, vines, lianas, and trees, with an extremely high diversity of ca. 751 living genera and ca. 19,500 species [10, 17] across different habitats of the world. Meanwhile, this family has an abundant and diverse fossil record, and its characteristic fruits, flowers, pollen, foliage, and wood have been well recognized from numerous Cenozoic localities around the world [65, 66]. However, an outstanding incongruence between the palaeobotanical finds and molecular systematics of legumes is that the earliest fossil record of the tribe Cercideae as sister to all other lineages in the molecular phylogenetic trees of Leguminosae [9–14, 20–24] has so far occurred later than that of some derived tribes bearing compound leaves such as Sophoreae Spreng. ex DC. in the subfamily Papilionoideae L. ex DC. . Such an incongruence implies that the extant Cercideae bearing the simple, entire or bilobate to bifoliolate foliage is unlikely to be the most primitive in Leguminosae, but the derived as some authors formerly suggested from an extinct legume ancestor possibly with palmately compound leaves  or pinnately compound leaves [27, 69]. The fossil record of the Cercideae lacking or being fewer than those derived tribes in the early Palaeogene of middle latitudes is because either the early distribution of the Cercideae might be restricted to low latitudes, or palaeobotanical studies on the coeval legumes from low latitudes are relatively inadequate . Hence, the Cercideae fossils, especially from low latitudes, can provide an historical perspective for their early evolution, adaptive radiation, and biogeographic history. Leaves of Cercis have been reported from Late Cretaceous and Cenozoic sediments, but the overwhelming majority of these reports have been rejected, questioned, revised [59, 71], or in need of confirmation by reinvestigation of the original materials and discovery of better preserved materials  (see Additional file 4). The oldest reliable fossils of Cercis are represented by the foliage and/or fruits (i.e., C. parvifolia Lesq., C. herbmeyeri H. Jia et Manchester) from the Late Eocene Florissant Formation, Colorado and John Day Formation, Oregon, western USA [71, 72]. 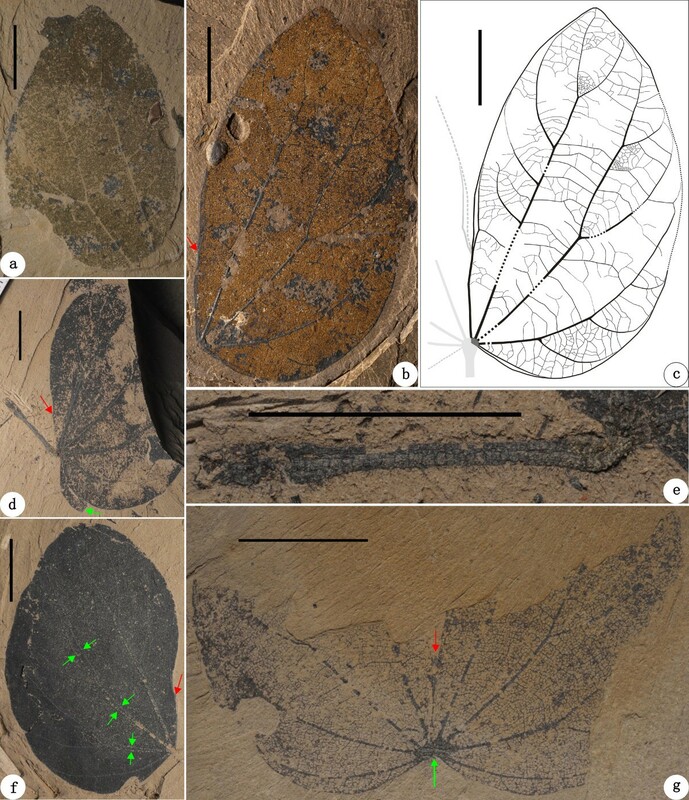 In contrast, the foliage fossils of Bauhinia have been previously reported from the Late Cretaceous and Palaeogene of North America and Eurasia [73–88], but these identifications are erroneous or unreliable  (see Additional file 4). Although Bauhinia or Bauhinia-like bilobate foliage have been recently reported from the middle Eocene of Tanzania , the late Eocene of Vietnam , the late Eocene-early Miocene of Brazil , and possibly the latest Oligocene–mid-late Miocene of Australia , the preservation of these pre-Miocene fossils, which are observed from the originally published figures, appears too poor to reliably assign these leaf fossils to either Bauhinia or even Cercideae, because neither the pulvinus nor basal actinodromous or acrodromous venations can be confirmed (see Additional file 4). Instead, the oldest reliable evidence of Bauhinia and Bauhinia-like foliage are provided from the Oligocene Ningming Formation, Guangxi, South China (i.e., Bauhinia ningmingensis sp. nov., B. cheniae sp. nov., and B. larsenii D. X. Zhang et Y. F. Chen , this paper) and Coatzingo Formation, Puebla, Mexico (i.e., Bauhcis moranii Calvillo-Canadell et Cevallos-Ferriz ). By the Miocene–Pliocene, various species of Bauhinia have existed in Thailand, India, Nepal, Uganda, and Ecuador (Figure 4) while those of Cercis have become widespread in mid-latitudes of the northern hemisphere [69, 71]. In addition, some other unifoliolate or bilobate foliage or fruit fossils from the Oligocene—Miocene of Jinggu (Yunnan), Zhangpu (Fujian), and Ningming (Guangxi) in South China have been reliably described [93–95] or preliminarily identified as Cercis and Bauhinia (Unpublished observation by Qi Wang, Institute of Botany, Beijing, October 18th, 2013). Also, the bilobate foliage extremely similar to Bauhinia has been discovered from the Eocene - Oligocene coals of West Sumatra, western Indonesia (vide the image of this leaf fossil and information provided by Drs. Yahdi Zaim, Institute of Technology, Bandung, Indonesia, Peter Wilf, Pennsylvania State University, and Gregg F. Gunnell, Duke University Lemur Center, March 17th 2014). Hence, more Cercideae fossil will be studied and reported from low-latitude tropical zone  of East and Southeast Asia. Recently, a strictly east-to-west vicariance for the historical biogeography of Cercis has been postulated by molecular data . The Cercideae macrofossils occurring in the Eocene to Oligocene of mid-low latitudes and apparently lacking in the coeval sediments at high-latitudes appear to partially support a tropical Tethys Seaway origin and spread [11, 22, 23] or an “Out-of-Tropical Asia” dispersal  of the Cercideae and the Leguminosae as formerly hypothesized by some authors. However, detailed historical biogeography of Cercideae still need more palaeobotanical and molecular dataset. 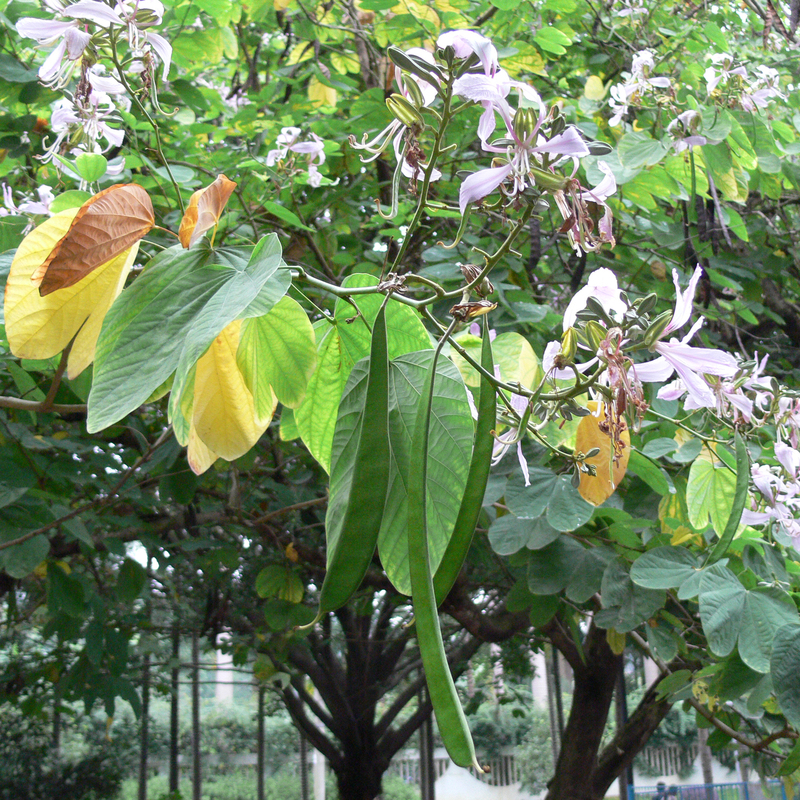 Bauhinia has exhibited a certain diversity with three species (i.e., B. ningmingensis, B. cheniae, and B. larsenii) bearing bifoliolate or bilobate leaves in a low-latitude locality—Ningming since at least the Oligocene, implying the tropical zone of South China may represent one of the centres for early diversification of the genus. The reliable macrofossils of Bauhinia and Cercis have made their debut in the Eocene—Oligocene floras from mid-low latitudes and appeared to lack in the coeval floras at high latitudes. By the Miocene–Pliocene, various species of Bauhinia have existed in Thailand, India, Nepal, Uganda, and Ecuador while those of Cercis have become widespread in mid-latitudes of the northern hemisphere. Such a biogeographic pattern implies a possible Tethys Seaway origin and spread for legumes. However, detailed scenarios for the historical biogeography of Bauhinia and its relatives still need more robust dataset from palaeobotany and molecular phylogeny in future research. the author citation of plant names in this paper and journal titles in References follow Brummitt and Powell  as well as Botanico-Periodicum-Huntianum (BPH), its supplement (BPH/S), and BPH-2 , respectively. The herbarium codes refer to Index Herbariorum . We greatly thank two anonymous reviewers for their useful comments and suggestions. Dr. Chen Gengjiao, Mr. Xie Zhiming and other colleagues, Natural History Museum of Guangxi, Nanning for assistance in the field. Dr. Shi Gongle, Nanjing Institute of Geology and Palaeontology, CAS, Nanjing, Dr. Steven R. Manchester, Florida Museum of Natural History, Gainesville, Dr. Yahdi Zaim, Institute of Technology, Bandung, Dr. Peter Wilf, Pennsylvania State University, and Dr. Gregg F. Gunnell, Duke University Lemur Center, Durham for providing us with unpublished images, manuscripts, and thesis. Mrs. Anna Pavlova, National Institute of Carpology, Moscow, Dr. Yulia V. Mosseichik, Geological Institute of the Russian Academy of Sciences, Moscow, Dr. Boris I. Pavlyutkin, Far East Geological Institute, Vladivostok, Prof. Martin Pickford, Muséum National d’Histoire Naturelle, Paris, Dr. Mike Pole, University of Tasmania, Hobart, Prof. Rakesh C. Mehrotra, Birbal Sahni Institute of Palaeobotany, Lucknow, Prof. Subir Bera, University of Calcutta, Kolkata, Dr. Silvia N. Césari, Museo Argentino de Ciencias Naturales “Bernardino Rivadavia”, Buenos Aires, Prof. Vladan Radulović, University of Belgrade, Belgrade, Dr. Huang Junhua, Xinjiang Agricultural University, Urumqi, Dr. Yang Yong, Institute of Botany, CAS, Beijing, and Dr. Xue Jinzhuang, Peking University, Beijing for providing us with some key references. Mr. Zong Ruiwen, China University of Geosciences, Wuhan for graphing Figure 2. Mr. Sun Yingbao, Institute of Botany, CAS for offering a world base map in Figure 4. This work was supported by the National Natural Science Foundation of China (nos. 41372029 and 41162002), the State Key Laboratory of Systematic and Evolutionary Botany, CAS (no. 56176G1044), and the State Key Laboratory of Palaeobiology and Stratigraphy, Nanjing Institute of Geology and Palaeontology, CAS (no. 123106) to QW, ZYL and YFC. ZYL, YFC, QW, and SS conducted data analyses, taxonomic treatments, and evolutionary and biogeographic interpretations. QW and ZQS photographed specimens, illustrated the line-drawings, and arranged the figures. QW wrote the manuscript and formatted the text. All authors read and approved the final manuscript. eFloras.org. St. Louis: Missouri Botanical Garden & Cambridge: Harvard University Herbaria, Published on the Internet [http://www.efloras.org/] (accessed 9 May 2014). Chinese Virtual Herbarium(CVH): A National Taxonomic Database. Beijing: Institute of Botany, Chinese Academy of Sciences, Published on the Internet [http://v5.cvh.org.cn/] (accessed 15 April 2014).